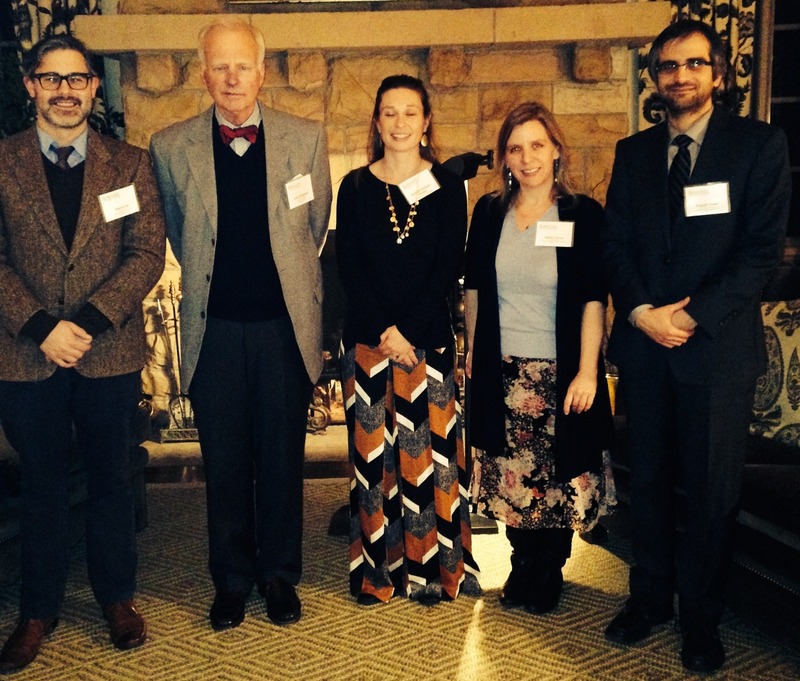 The Society of Sewanee Scholars (SSS) held its annual dinner celebrating Outstanding Teaching at the College on March 3, at Chen Hall. Six teachers were honored: first-year Assistant Professor Eugenii Donev (Physics), Dr. Mindy Farris (Biology), Dr. Matthew Irvin (Medieval Studies), Nicole Noffsinger-Frazier (Psychology), Dr. John Reishman (English), and Dr. Katherine Theyson (Economics), all of whom have contributed significantly to the learning experiences of the students who nominated them. Dr. William Engel, (English and Humanities) served as the event coordinator on behalf of the SSS leadership, and planning and hosting was by provided by John and Bonnie McCardell, as well as Teresa Smith. Farris and Reishman spoke on particular classroom assignments that yielded results that showcase Sewanee students’ initiative and ingenuity. Farris focused on how students whole-heartedly threw themselves into biological role playing lessons, whether as protein components of a cell or as members of diverse ecosystems in which every part must be played in just the right way for the whole process to function properly. Reishman reflected on the goals of reading closely and writing critically about the best that literature has to offer. He mentioned his optional “journaling assignment,” in which students write a few paragraphs each night about some specific incident of the day, and even spoke of several humorous journals that he had received over the years. This process of reflection through regular practice of writing in standard English has yielded excellent results. Their remarks were followed by a dinner where students had a chance to get to know their teachers better, along with special guests, John Gatta, Dean of the College, and Larry Jones, Associate Dean of the College. Topics of dinnertime discussion ranged from the recent political controversy in Ukraine to the previous night’s Academy Awards. The SSS believes every teacher at Sewanee is outstanding and each year seeks to highlight the contributions of teachers from a variety of disciplines who demonstrably exhibit compassionate and innovate approaches to student learning. This dinner is part of an ongoing effort sponsored by the SSS to generate important conversations among students, teachers, and administrators about creative and thoughtful pedagogy.